What do you do for a living and what are your hobbies and interest? Career-wise, I’m definitely in a transitional period but I would say I’m a singer songwriter/mentor/youth worker! I love all kinds of music, especially jazz, jungle and reggae and anything with a wicked bass line but I’ll listen to most things. I love to sing and watch live bands and other artists, reading, spending time with friends and food, eating it mostly! Oh yeah, I’m obsessed with looking at the sea/ocean and the sky… And trees… And mountains… Ok, nature basically. But something I’m definitely into is empowering young people to reach their full potential, mainly through the arts. 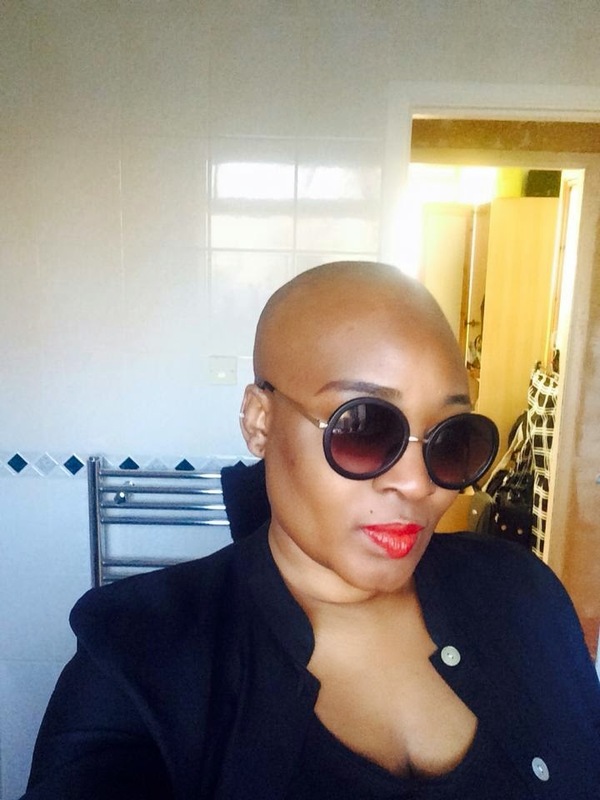 How long have you had Alopecia and has it impacted your life in a negative way? I’ve had alopecia areata for about 11 years now, to varying degrees where sometimes it’s been the odd bald patch, to almost completely bald with parts of my eyebrows and other body hair missing. It has definitely impacted my life negatively: I’ve missed countless important events in my life, such as my best friend’s graduation and the christening of another friend’s son. Because the alopecia started when I was a teenager, it really impacted on my self-esteem, dealing with your hair falling out as well as all the other stresses of teenage life is not easy and I suffered with really low self esteem and depression for a long time. Have you learnt to embrace it, and if so how? it’s taken a while, but I have learnt to embrace it. Initially, instead of hiding behind dull black head scarves, I invested in different wigs. I’ve always been creative with my hair so I saw it as a way to try out lots of different styles. Even with looking good in the wigs though, I always felt a huge burden that underneath I was practically bald. In 2012, thanks to some great and loving friends’ encouragement and support, I removed my headscarf in front of them, to ‘unveil my dome’. There was so much love in the room, it really empowered me and I haven’t looked back since. I spent lots of time looking in the mirror and telling myself I was beautiful even when I didn’t believe it. Now, I love the way I look, and actually feel prettier than I ever have! Do people stare at you on the street? Do you feel like you stand out in a good/ bad way? I do get a fare few stares on the street, although I feel it may be less now, since thanks to celebs like Amber Rose and others, many women are shaving their hair low, if not bald too. I find it’s mainly little children who stare a lot now, and I even get asked if I’m a boy or girl! But, children are always sweet and I’m happy to answer their questions when they ask why I’m bald. I have gotten lots of compliments too, that being bald really suits me and brings out my features more so I’ll take that as a good thing! You seem really confident, what advice would you give to other people who suffer from it and are afraid of what people might think of them? I am confident now but it has taken a long time to get to this point. For others who have alopecia, I would say this: if you want to wear a wig, do so. So many people nowadays have weaves and wigs now it can be hard to tell. Never feel obliged to tell people but I know a huge weight was lifted off me when I told people and eventually showed them. But, if people have something negative to say because you’ve lost your hair, it might be worth considering if they’re genuine friends. If they love you, hair or no hair it shouldn’t make a difference. I found it liberating to raise awareness of alopecia when I was asked questions but remember, it is your business who you wish to tell. As India Arie sings, ‘I am not my hair’ so remember that you are worth so much more and having hair or not doesn’t define you. Do what you can to stay healthy, eat well and take supplements because sometimes alopecia can be attributed to vitamin deficiencies but there isn’t a cure so if your hair doesn’t grow back, it isn’t the end of the world. You have to decide to keep strong and eventually you will feel better. Treat yourself, try out new clothes, make-up etc, it will help! If your hair grew back would you keep the look you have or do you fancy a change? Do you know what? I really love the way I look now so I’m not too fussed but there are days I’d love to have box braids or rock a twa (teeny weeny afro)! I do really get bored so I tend to switch it up once in a while with headscarves. But ultimately, whatever happens, now that I’ve been bald, even if I grew hair I think I’d always come back to bald… Unless my hair grew so quick and I had a huge fro! And, do you know there are even box braided wigs now!!! So I could always get one of those while I wait for my hair to fully grow back! Do you feel unique because of your look? How would you describe your style in 3 words? I definitely feel unique being bald. I don’t know if it’s that I’m older or just generally more comfortable with myself but I genuinely feel more confident than I ever have in my life. I do feel like it makes me stand out and I like it! 3 words to describe my style are quirky versatile and fun. It’s a simple selfie, but Ché Kirah radiates confidence and beauty.